Another one of our dim sum day treats was an egg roll. These egg rolls are still a work in progress but this latest batch came out very tasty. 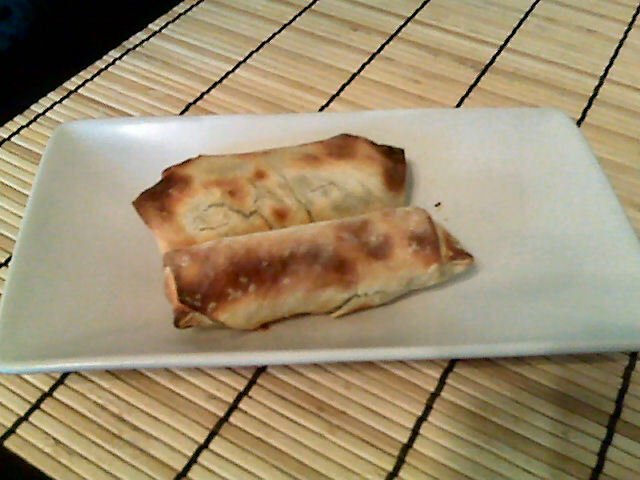 I’m trying to recreate these tasty egg rolls I had from several of the chinese restaurants when we lived in Halifax. One of them was just around the block from where we lived, much dim sum was had there as you can imagine. The flavours I got from those egg rolls was definitely curry and beef so I started there and have been trying to get them just right. To make them lighter I’ve been baking them or steaming them instead of going for the deep fryer. Sadly they don’t make for the best of pictures but they are working out quite tasty. Combine all of the ingredients except the skins in a bowl until well mixed. Place the skin so that it makes a diamond in front of you. Place 2 tsp. of the mix in a line at the bottom part of the diamond. Roll from the bottom corner once so that the mix is safely tucked inside. Wet the side corners and top corners with some water. Fold to side corners in and pinch the fold. Continue to roll upwards, the top corner should complete your roll and look sort of like an envelope. Once I make a bunch of these I tend to freeze them uncooked. From frozen I either steam them for 15 minutes in a bamboo steamer or bake them at 425F for 15-20 minutes. Give them some cooking spray if baking to help the top crisp up. This makes approximately 48 egg rolls…which is why I usually end up freezing a bunch and taking them out when I need them. It’s really fun to just pop on a movie and put them together for freezing. Each egg roll is 147 calories, 4.4 grams of fat and 0.7 grams of fiber. This entry was posted in Lunch, Snack. Bookmark the permalink.